Michigan State basketball will take on Nebraska Thursday night and here’s what the Spartan Avenue staff thinks the score will be. It’s been one roller-coaster of a season for Michigan State basketball. The Spartans opened with a near-upset of No. 10 Arizona and then dropped games against Baylor, Duke and Kentucky. 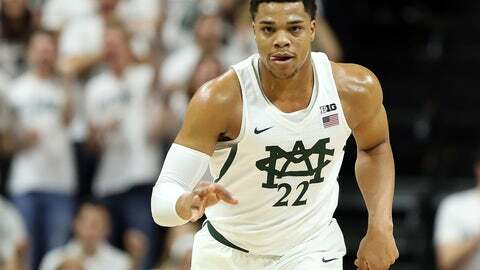 Looking to get back on track in Big Ten play following three straight defeats, Michigan State will hope to take down Nebraska in Lincoln on Thursday night. Nick Ward is battling sickness, Tom Izzo stated how he sees the Cornhuskers are a tough opponent and the upperclassmen aren’t contributing how anyone would have hoped. This team plays poorly on the road, but today could change that. Will the Spartans step up and steal one from Nebraska at home? Here’s how the Spartan Avenue staff sees the Michigan State vs Nebraska game playing out on Thursday. Connor Muldowney: Despite recent road struggles, the young Spartans will get out to a comfortable lead in the first half and guys like Miles Bridges, Nick Ward and even Eron Harris will get into the fun. Michigan State will extend the lead to 10 at one point in the first half but Nebraska will come storming back late. This game will go down to the wire, but a late bucket by Cassius Winston will put the Spartans on top for good. Ryan McCumber: Michigan State has won only one true road game this year at Minnesota. The Spartans have struggled with their young team. Meanwhile, Nebraska was able to beat Purdue at home Sunday. The Spartans are coming off a big win against Michigan. Nick Ward has been battling the flu and Nebraska will be a tough game on the road. I expect Nebraska to win in a close game. Adam Zdroik: I don’t like anything about this game. The hope is that Michigan State sees the three-straight losses and takes it personally to win. But with freshmen leading the way, I’m not sure that will be the case, especially with Nick Ward battling sickness. The Cornhuskers are a hard team to beat at home and I’m still not sold on the Spartans closing games. Missed free throws costs them.